F&S Elektronik Systeme has been working on a new SBC part of their ArmStone family with ArmStone MXM8 single board computer, featuring NXP i.MX 8M quad core Cortex A53 processor, and supporting up to 8GB LPDDR4 RAM. The Pico-ITX board also comes with up to 32GB eMMC flash, integrate Gigabit Ethernet and wireless connectivity, DVI and dual-channel LVDS outputs, USB 3.0, PCIe and more interfaces. 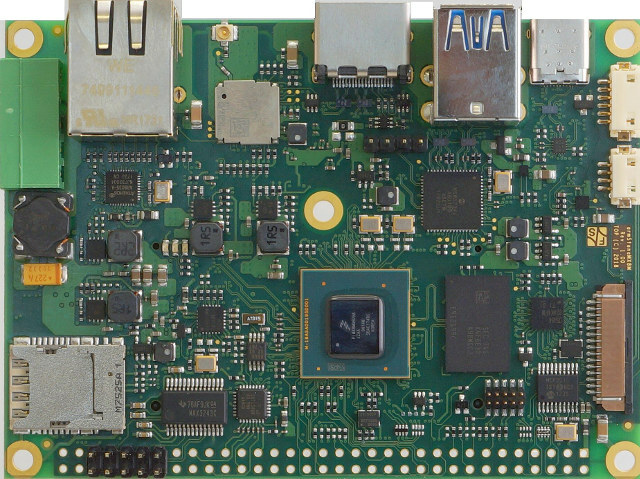 The layout is very similar to the company’s ArmStone A53SD pico-ITX board launched last year with a Qualcomm Snapdragon 410E processor. Power Supply – 5V DC via terminal block? The company will provide software support via Buildroot or the Yocto Project 2.2 with the Linux BSP containing Linux Kernel 4.9.x, U-Boot 2017.03, drivers, examples, and software & hardware documentation. A starter kit will also be offered, but not details have been posted at this stage. F&S Elektronik Systeme expects to start selling the board in Q2 2018 at an undisclosed price. Most information is preliminary, and work-in-progress, but eventually more details should surface on the product page.